‘Fancy a trip out to Sheffield on Tuesday, Sean?’ asked our Exec Publisher, Roger Kean knowingly. He rubbed his palms in eager anticipation of my reply. ‘Sure,’ was my nonchalantly issued response. I felt like giving BR some hassle anyway. But it wasn’t as simple as that — is it ever... No, Roger said that he could hire me a car (Mad Max meet Mad Masterson). Roger drew me an ‘excellent map’ (his words, not mine). The excellent map showed me how join the A68 from the A5. Yours truly drove up and down the A5 for two hours looking for a non-existent A68... Come back BR, all is forgiven. In the meantime — ROGER!!!!! I made it to Sheffield in the end, of course. I’m a genius after all. Soon I was inside the hallowed offices of Gremlin Graphics and it was down to business. Interactive fantasy stories have been popular for a few years now, and the craze has still not reached its peak, according to the marketing research people. One of the latest series to appear is the Way of the Tiger series published by Knight books, co-written by Jamie Thomson (ex features editor of WHITE DWARF magazine) and author Mark Smith. The series puts the reader in the role of a ninja warrior in a series of martial arts adventures flavoured with a touch of fantasy. Gremlin have acquired the rights to produce the computer game tie-ins to the range and I was there to get a glimpse of the first of their games. As Ian Stewart, the Gremlin Guru, explained, the first of the games is an arcade adventure but subsequent games will be more conventional adventures with no animation. Way of the Tiger is also the title of the first game and the plot is something of a prequel to the series by Messrs Thomson and Smith. It involves a really nasty piece of work who has cold bloodedly killed off a close relative. You are out to avenge the death but before the final confrontation, there are a variety of other beasties and evil-doers to eliminate. This screen shot reveals the variety of moves — but wait till you see the animation! You have two characteristics — Endurance and Inner Force, the levels of which are constantly displayed in the lower part of the screen. When these are both thoroughly depleted, it’s good old Game Over time. They are wittled away by receiving and applying damage to or from the various creatures and enemies likely to be encountered during the game. Of course receiving damage results in more of a characteristic being depleted than making a successful attack upon something else, but even then, the amount of Endurance or Inner Force lost, is related to what is actually involved in the combat sequence. So what do you actually see on the screen? Well, as might be expected, the atmosphere is distinctly oriental. The foreground and middle distance are littered with ancient ruins, willow trees (courtesy of some fabled plate designers) and boulders. It is possible to move behind or in front of some of these. In the far background were some distinctly Himalayanesque mountains. Incidentally, in the screen shots elsewhere on these pages, the mountains for the Spectrum version are situated so low as to cause colour clash when a character jumps. This will be altered for the final version with the mountains being ‘further away’ to avoid this happening. This area is approximately twenty screens across and you are free to wander wherever you may, fighting the baddies. Ah yes, as for the baddies, there are several. Some of these are other Ninjas of varying fighting ability and intelligence. There are also some sword wielding Goblins, some horned, bipedal and vicious looking weirdos and some really nasty Giants. Each of the different creatures require different fighting techniques. For instance, it’s impossible to do a flying kick against a Goblin because the little terrors are too small. It’s also useful to remember that getting too close to the Giant is fatal because of his incredible strength (the entire screen shakes when he walks on). Constant backing away while risking the occasional flying kick is advisable when dealing with one of these. One of the interesting features about the way the game handles combat procedures is that if your (or your opponent’s) strength is low, then the amount of damage inflicted by a given blow is also low. As is the norm with recent games of this type, several different moves are available by careful manipulation of the joystick. Where Gremlin have tried to go one better than their competitors is in the animation of these moves. Both the character and the monsters are well drawn and animated. When a chop is delivered to another Ninja’s neck, his head snaps backwards as it would in real life. Similarly, a well placed kick will have the opponent clutching the wounded area. If two opponents bypass each other, they actually turn around to face the other, rather than being ‘flipped over’ as in other games. The fighting sequences really are dramatic with a great variety of moves and smoothness in play. There are some other good features such as the three stage scrolling which adds to the perspective effect. Some of the baddies jump out from behind boulders or even out of the ground itself. Although there are a set number of creatures to fight, the freedom of movement means the process should never become repetitive or dull. 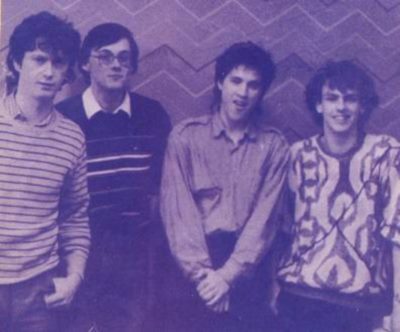 The Gremlin programming team, left to right: Shaun Hollingworth, Peter Harrap, Marco Duroe and Chris Kerry — a ‘quiet’ bunch. All that had been programmed when I was there was the screen itself. It looked fantastic, however with a distant but graphically detailed pagoda in the background, its delicate form gently reflected in the lake. One hell of a setting for a martial arts fight. When this is successfully completed, the climactic part of the game is reached. This consists of a bit of Katana wielding against some particularly evil Samurai warriors. The Spectrum version is on schedule for intended release in February 86 and all machine versions of the game will be sold at around the ten pound mark which, from what I saw, would appear to be a case of good value for money.